There are many ways to Earn Money Online, Some work but some don't work. I am going to share a way of earing money today, I've tried this one and it really works! Everybody reading this post will be aware of Google Adsense. Google Adsense is one of the most popular way of earning money online, But to earn from google adsense, you should be a Website holder or blogger and you should have a big Traffic on your site. The way i'll show you today will work for anybody, With or Without website. so lets begin. Do you share links? Adf.ly helps people shortening links so that they can share those links with other people without worrying about the Character limits. You can shrink any links, It can be Youtube videos, Web pages, Download links etc. Just shrink long urls and share them. Adf.ly lets you shorten urls and pays you money for number of visitors visiting that urls, The money depends of the people visiting the urls. Once you've reached the minimum payment threshold which is $5, then you can withdraw money using PayPal or Alert Pay. Here is my most recent payout proof (November 2012), This also proves that Adf.ly still works, for those who think that they've stopped paying publishers. For me Adf.ly is an awesome way to earn some extra dollars just by shrinking urls and sharing them instead of normal urls. 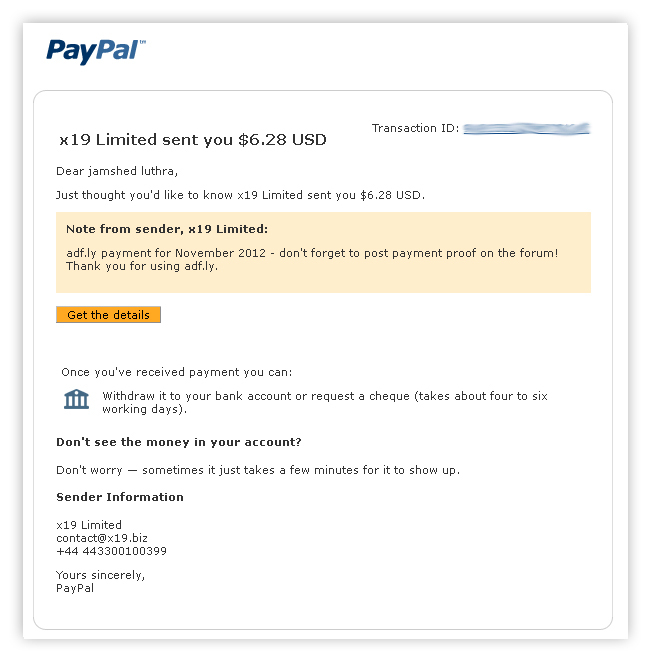 Here is a Email from Adf.ly (x19 Limited) saying that they've sent $6.28 to my PayPal Account. This is my first Adf.ly payment from my new account. As you can see in the above email screenshot that Adf.ly really pays their publishers and it is not a scam, so what are you waiting for, Click the below banner and start earning. I Hope this post was helpful, Please leave your comments below expressing your views about Adf.ly. If you have some other alternative better than this then don't forget to shar it with others.